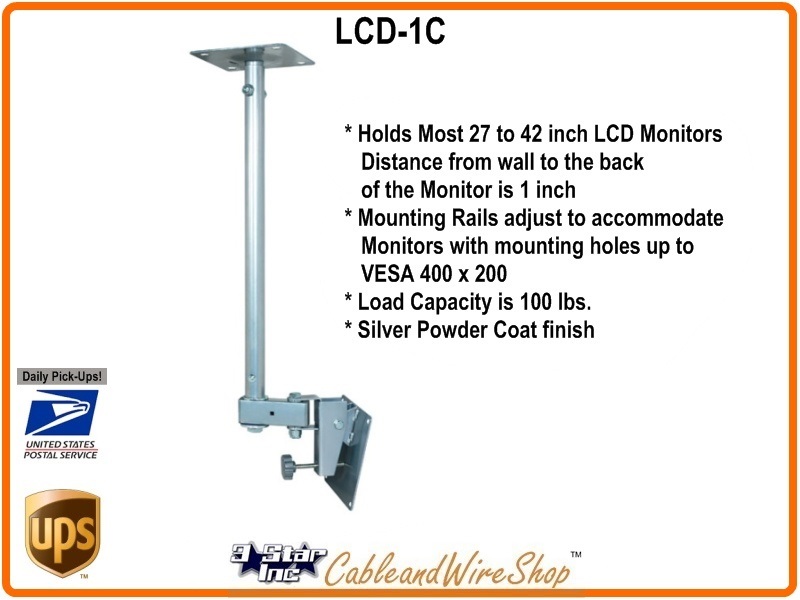 Holds most 10 to 23 inch LCD Monitors, Telescopic 17 to 27 inches down with 75 and 100 mm VESA Standards. The Mast Telescopes 17 to 27 inches from the Ceiling in 360 degree Rotation and a Tilt Angle of minus 5 to plus 20 degrees with additional rotation at Monitor of 240 degrees. This Mount has a Load capacity of 25 lbs. and comes in a Black, White or Silver powder coat finish. This mount is designed to attach to a load-bearing member or other suitable support surface and primarily composed of Tubular steel, arc welded, and with Nylon filled Nuts. This adapter allows the LCD-1CB to accommodate two 10"to 23" flat panels back to back.